If you’re looking for a quick explanation check out The Flowtime Technique Cheatsheet. I have all kinds of problems with the Pomodoro Technique, so I started brainstorming an alternative to the that eliminates the PomoStress I’ve been experiencing while still 1.Tracking my time 2. Encouraging unitasking, and 3. Enabling breaks. The Flowtime Technique I have created does all these things, while also encouraging Flow. Flow is when you are completely focused and immersed in a task. It feels great, it’s very productive, and it’s the kind of productive feeling that we all strive for. It’s hard to achieve flow when you’re worried about being interrupted. YES, my handwriting is terrible. First, pick a specific task. Make sure it has an end in sight. If you have something in mind that doesn’t have an end in sight, set your sights a little shorter. This goes under tasks. The next step is the hardest step. When you feel like you need to take a break, take a break. If you want to stop the task, stop and take a break. If you’re having difficulty focusing or you notice your attention slipping, stop and take a break. If you’re getting mentally fatigued, take a break. If you’re frustrated, take a break. It’s better, at first, to start breaks more frequently than you think you might need to. It takes time to learn what “I need a break” feels like. When you decide to take a break, write down the time you stop under Stop. Then decide how long your break will be and set a timer for that length of time. Right now I’m going with 5 minutes for around less than 25 minutes of work time, 8 for around 25–50, 10 for around 50–90 and 15 for more than that. The break times I suggest aren’t rules. If you need 10 minutes of break time after 40 minutes of work that’s fine, refreshed work is orders of magnitude better work than fatigued work. Less time is fine too, as long as you are letting yourself get enough of a break in. It’s better to break longer than wear yourself out with tiny breaks. Sometimes you get interrupted or distracted, either internally or by someone else. When this happens, thats fine. Just record the time you get interrupted, deal with whatever has come up, check the — | part of the table and then continue as normal. Repeat until you’re done with what you have to do! 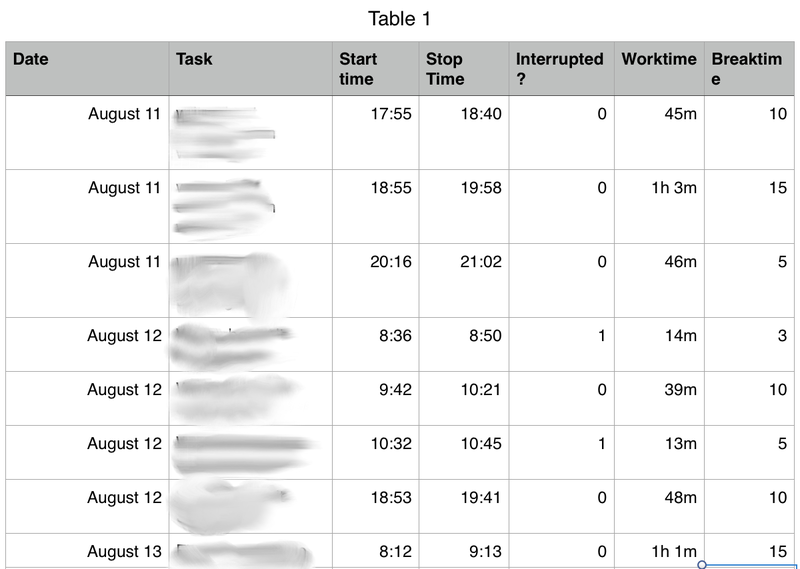 You can record your Work Time (in minutes) as you go, or when you finish a task, or even at the end of the day. This is important data you can use to plan your day, notice your most productive times, and notice any correlation between lengths of breaks and sustained work time. With the Flowtime Technique you input your start time, end time, break time, work time, and whether or not you were interrupted. With a bit of data mining and maybe plugging stuff into exel, you can graph your productive times of day, how long you can work after an x minute long break, what your average work length is what times of day you are most productive, etc. With the data you gather with FlowTime you don’t only see how many big chunks it takes to complete a certain type of task, you see the exact time the task took, you will see your patterns of fatigue and recovery, and you will learn to schedule your most difficult and fatiguing tasks in your most energized part of your day. By picking one task and writing it down you commit to only doing that one task between the time you start and the time you choose to stop. 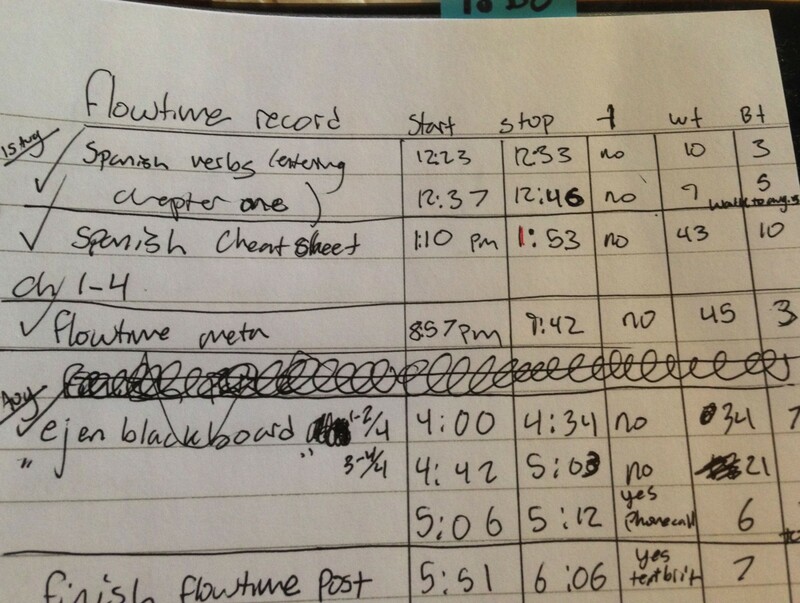 A timer might not be watching you work but you are still putting yourself on the hook by writing down your one task. The flexible breaking makes necessary switching between tasks easy, so you never have to “just take this one call” while you’re trying to finish a Pomodoro. With Flowtime you never interrupt flow with a mandatory break. A timer will never interrupt your train of thought or your time in flow. So, Im really excited about this technique. I am going to use this system exclusively this upcoming week, my first week of class. I will give you guys an update on how the system works for me, and show you all a bunch of my Flowtime data and analysis. I am a student. I read and write and have opinions about things. Aspiring teacher.